Originating in Southwest Korea several centuries ago, the Jindo were bred to hunt badgers, rabbits, deer, and wild boar. This breed is protected by Korean law as a National monument, and is the most favored and popular breed in Korea. The Jindo breed did not appear in the United States until the 1980's and is considered to be uncommon in North America, since the Korean government restricts their exportation. The Jindo breed is a Spitz-type dog of medium size. This breed is independent, cautious, and is an ideal hunter. Jindo's are extremely courageous, active, and intelligent. The Jindo is renowned for their homing instinct. This breed has a very high prey drive. Jindo's are not recommended for an inexperienced dog owner as their independent nature and strong will can make them difficult to handle. The Jindo possesses strong and unwavering loyalty to their owner and family and is deeply devoted. For this reason they do not do well at being re-homed. They are affectionate, friendly, and gentle. They make excellent watchdogs and will fight to the death to protect their family and home. The Jindo breed does best in a home with older considerate children and other dogs it has been raised with. Due to their naturally high prey drive, non-canine pets in the home are not recommended. This breed thrives on living indoors with the family and will become destructive if bored or lonely. The Jindo breed requires regular brushing of the coat as it will minimize loose hair. During the heavy, twice a year shedding season, daily brushing is an absolute must. Frequent warm baths during this time help with the shedding process. The Jindo has no health issues due to limited intervention of human breeding. 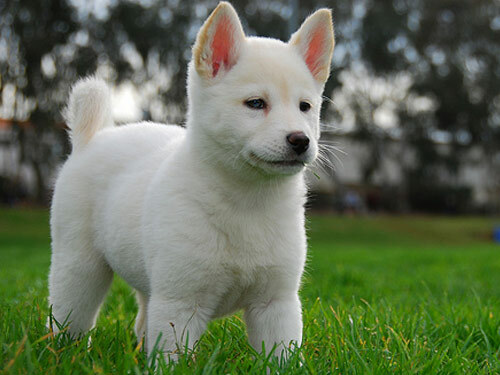 The Jindo is a double coat breed. The outer coat is straight, harsh, and more profuse on the neck and chest. The undercoat is dense and soft, but is sufficient to support the outercoat. The Jindo sheds heavily twice a year. Extremely obedient and fastidious, the Jindo breed is capable of housebreaking themselves. Early socialization and obedience training must be done with respect, firmness, fairness, and consistency. Proper training by the owner is absolutely crucial and is the difference between life and death. The Jindo is not recommended for apartment dwelling. They require a highly secured fenced yard to release their energy. This breed thrives on playing with family, but tug-of-war play is highly cautioned against. The Jindo will benefit from daily walks provided they are securely leashed and muzzled if in a public setting.